During the month of June of the year 1812, at the border between Russia and Poland, a group of men begin a singular march. It is the Grande Armée of Napoleon Bonaparte. Their goal is to invade Russia — a task for which 422,000 men have been summoned. It will be a futile effort, however. Utter destruction will come to them during the last months of the year. 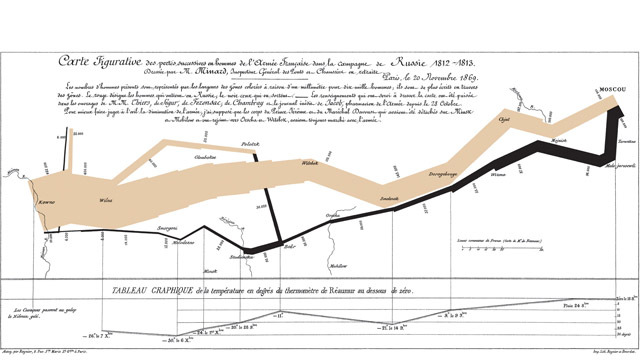 Fifty-seven years later, while in his eighties, a French civil engineer who has enjoyed studying streams and physics, and drawing maps of economic phenomena, will shift his interest to historical subjects. Charles Joseph Minard will depict the soldiers’ travesty in a single map one that has become irrevocably linked to Bonaparte’s march, and in its own way, just as iconic. Overlaid on the map of Russia, a brown band represents the diminishing size of Napoleon’s forces as the army moved up and down the latitude and longitudes of the vast country. The troops had passed the frozen Niemen River at a gallop, going from Kovno to Vilna before splitting at Polotzk. By September of 1812 only 100,000 soldiers had reached Moscow. Perhaps in the works of M.M. Thiers and the unpublished diary of Jacob, a pharmacist of the Army, Minard absorbed these details, as well as what happened next: With much of Moscow incinerated (historians debate whether the Muscovites deliberately set their own city ablaze, or whether the fires where accidental), the Czar and Moscow’s citizens fled the city. A stunned and empty-handed Napoleon was forced into retreat.